Natural grapevines are used as "filler cord" with a crocheted spiral design in multicolored yarn. Exposed stems and tendrils enhance the rustic appeal. 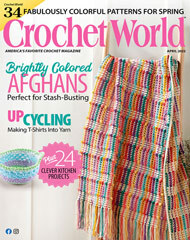 This e-pattern was originally published in the March 2011 issue of Crochet! magazine. Size: 4 1/2" x 6" diameter. Made with medium (worsted) weight yarn and sizes H (5mm) and I (5.5mm) hooks.